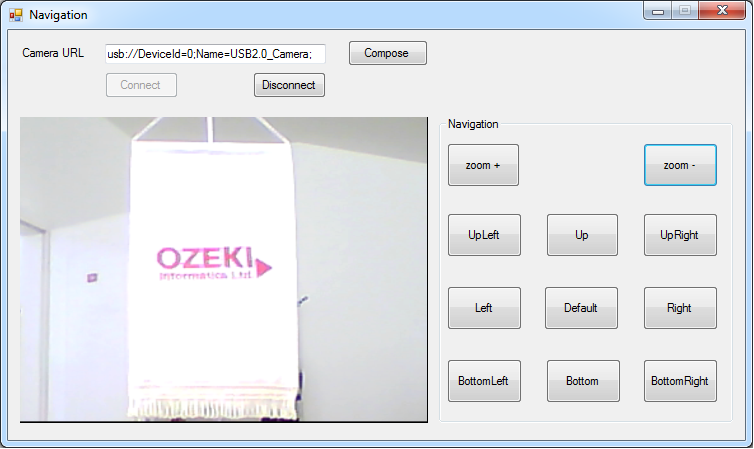 This tutorial will show how to use zoom function with your Ozeki Camera SDK in C#. Zooming is a convinient way of magnifiing a portion of the displayed image without moving the camera closer to the given area. To start, OZEKI Camera SDK has to be installed and a reference to OzekiSDK.dll has to be added to your Visual Studio project. In graphical user interfaces zoom means to make the picture appear larger. Zoom in if you would like to grow an image, and zoom out to shrink it to its original size. After zooming in, you may decide which part of the picture you are interested in. Use the control keys to go up and down or any direction (e.g. left, up and left, right and down, etc.) to adjust the display to your needs. You can zoom out to get the whole picture. For example, you would like to make sure that all the people staying in the sea are safe. You recognize that there are some swimmers far from the beach. By using zoom you can get a closer view to see that none of them are screaming for help. This function is really popular because it helps you to focus on certain parts of the captured image without moving the camera. IsRunning: If zoom function works the value is true and false if it is not. IsDefault: The value is automatically true when the original picture is seen and false if the zoom is used. Factor: It represents the measure of zoom. Start: Start initiates the zoom function. Stop: Terminates the zoom function. Default: Resets the camera to the original size. In: This method grows the selected image by one unit. Out: This method shrinks your picture by one unit. Zoom Direction enum: Defines the direction. Type Int value: Defines the measure of excursion during a period in direction given before. Type Int value: Describes measure of excursion in pixels in direction given before. StopMovement: By using this method ContinuousMove stops. By reading through this lecture you can find examples and implementations for zooming in C# using the Ozeki Camera SDK software. After examining this guide you will be fully familiar with the subject of selecting an area of interest on captured video frames with a bitmap image. What is the origin image? Any image which can be found in your image collection before any transformations are applied is an origin image.